Possession of birds, cats, dogs, reptiles or other animals in any part of a University Housing facility is not permitted, except as described below: Certified service animals that assist people with disabilities are permitted as required by law. Documentation regarding the need for a service animal, as well as what services/tasks they perform, is required when making such an accommodation request. 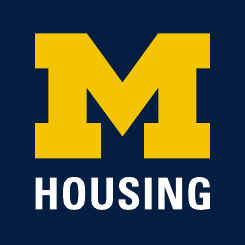 Please contact the Housing Information Office at (734-763-3164) or at housing@umich.edu to obtain information on the review and approval processes that must be completed prior to bringing such animals or comfort animals into any University Housing facility. Fish tank size cannot exceed 10 U.S. gallons in residence halls and Northwood I-V apartments and Munger Graduate Residences. Flesh-eating species (e.g., piranha) are not permitted. All appropriate precautions must be taken to ensure that the electrical connection to the fish tank is safe, and that other potential hazards have been properly addressed. The contract holder must ensure the maintenance of the fish and tank, including over break periods.